Charity Gaming – Gaming For A Good Cause! Gaming For A Good Cause! Charity Gaming is a non-profit organization providing children, suffering from chronic diseases, video games to bring joy back into their lives. Hospitals do not have a budget line to pay for expensive video game systems and games. They have to spend money on providing the care, so Charity Gaming helps our children and the hospitals. Charity Gaming understands that video games have the ability to make children happy and happiness is proven to lead to better outcomes for patients. Video games can help heal children. Every day, 43 children are diagnosed with cancer. 12% of children diagnosed with cancer do not survive. Children’s cancer affects all ethnic, gender & socio-economic groups. The average age of children diagnosed is six. More than 40,000 children undergo treatment for cancer each year. 60% of children who survive cancer suffer late-effects. 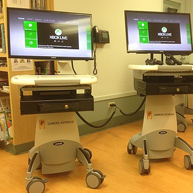 Equipped with a gaming console (Xbox One), monitor, controllers, an assortment of games and helps provide patients with a familiar social environment through gameplay. Providing video games to children to make them feel like a kid again is the basis for all that we do. 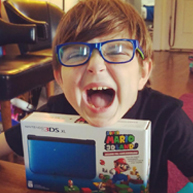 100% of money raised goes towards purchasing games for children who need them most!